Julio Lamos pushed his snowblower down a Chestnut Hill sidewalk in March 2017. Nicholas Phillips has almost come to dread winter. Every time there's a significant snowfall, he'll likely be seeing a patient who has lost parts of his fingers trying to clear a clogged snow blower. Phillips is an orthopedic hand surgeon with Holy Redeemer Health System. The injuries are disturbing not just because they can be gruesome, but because they are preventable. It's not necessarily that people are stupid or careless. The injuries are the result of a moment's inattention, perhaps. More commonly, people do not realize that even if the machine has been turned off, the blades often will still move when they are cleared of an icy clog. In a single moment, a person's life is changed. Nicholas Phillips is an orthopedic hand surgeon with Holy Redeemer Health System who sees serious injuries due to snow blowers, including amputations. According to national statistics from the Consumer Product Safety Commission, several hundred people a year lose parts of their fingers in snow blower accidents. Looking at the accidents in 2016, although a few men suffered heart attacks while using snow blowers, and one backed into the blade and cut his leg, most involved lacerations and amputations of fingers. The American Society for Surgery of the Hand has profiled the typical patient: a 44-year-old man with amputations of the tips of his fingers – most often the middle finger – on the dominant hand. Common weather conditions include snow accumulations of greater than six inches and temperatures of about 28 degrees. Phillips recently spoke to us about these accidents. What is a typical scenario? Injuries usually occur when the snow is heavy, wet, or has accumulated several inches. The snow clogs the exit chute of the machine, and the person using the machine tries to unclog this using his hand. Unfortunately, the blades still can rotate when the machine is off, and they cut whatever is in their path. Most people are surprised. They thought that once they shut the machine off, they wouldn't have that issue. Some people are lucky enough that they only lose a little skin off the tips of their fingers. More often than not, it's much worse. Usually there's bone, tendon and joint involvement. If there isn't enough soft tissue covering the fingertip, a surgeon may have to take away more of the finger – more of the bone. The main goal is to make sure they don't have bone exposed to the environment because that leads to a higher risk of infection. Patients' lives are forever altered. That's why I feel so passionate about getting the word out about this preventable injury. It can take up to two to three weeks for the areas of skin trauma to heal enough to allow for removal of the sutures. A challenging issue for patients is cold hypersensitivity since the trauma has altered their nerve endings. Depending on the level of amputation, their hand function may or may not significantly interfere with their vocation. For an individual who depends on fine motor function, such as a piano player, they may not be able to return to that in the same capacity. Others can often return to their jobs if the amputation does not compromise functions such as pinch and grip. Some published accounts advise that, if a person loses one or more fingers, the digits should be put into a plastic bag with ice and brought to the hospital for potential reattachment. Is that true? It depends on the amount of damage to the amputated digits. Unfortunately, with snow blower injuries, the amputated parts are too substantially damaged to allow for replantation. Cleaner cuts with less damage to the amputated segment such as from a sharp knife blade are more amenable to replantation. It's best for patients with any hand injury to default at saving the amputated part, wrapping it in a cloth or dressing and then placing it into a plastic bag with ice so a trained microvascular hand surgeon can evaluate and make that decision. 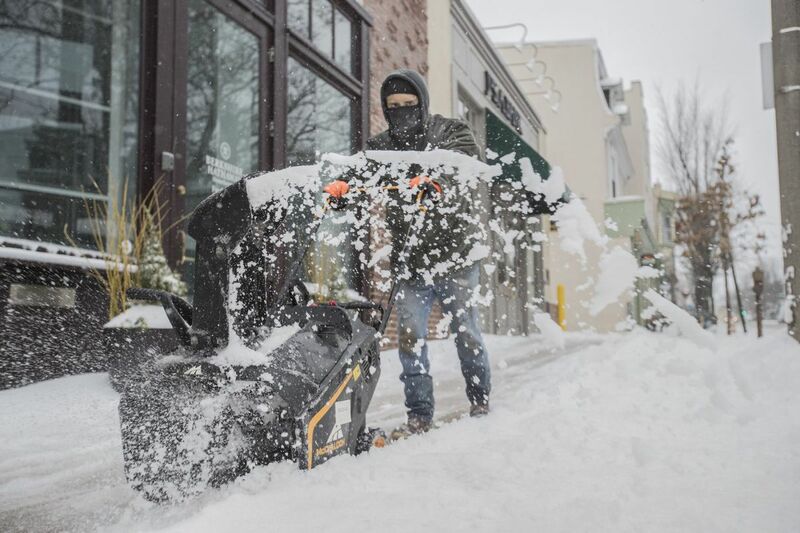 Do you have any snow blower safety tips to pass along? The main misperception is people not realizing the blades can still move, even if the machine is turned off. Some companies have devices that come with the snow blower to unclog the machine. Use it. If there isn't one, don't leave the store without getting a broom or something else to use to unclog the machine. Even the best machines clog up, especially when the snow tends to be wetter. Otherwise, the American Society for Surgery of the Hand recommends working at a brisk pace when you're using a snow blower. The faster you go, the less likely is it that the snow will stick to the blades in the first place. Some people spray the blades with cooking oil to keep them clear. Also, if it's a heavy snowfall, don't wait until it's over. Use the snow blower several times during the storm. If your snow blower does clog, turn off the machine and disengage the clutch. Wait five seconds for the impeller blades to stop rotating, and then use a stick or broom handle to clear the clog. Do not stick your hands into the chute. Keep all the machine's safety shields in place. Overall, wear boots with traction so you don't slip. Stay focused on the job. Don't drink alcohol or use narcotics before using the machine. What about other winter safety hazards? The more common winter injuries come from falling on slick surfaces. It's important for people of all ages, whether at home or out in the community, to wear boots or shoes that have good traction and make sure they're aware of the surfaces they're walking on. The most common injuries are fractures to the wrist, hip, ankle or shoulder.